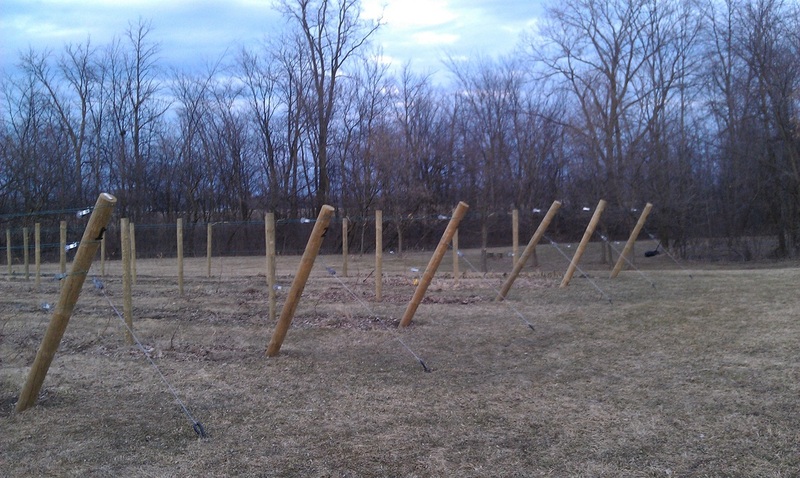 With the posts put in the next step was to run the trellis wire. I researched for a good month on and off for the best trellis system for my grape varieties. Let me tell you there is not a whole lot of info out there on what trellis to use for each grape, and if you do find a suggestion there are no explanations for why. So I found what little information I could, then made my choices based on the growth habits of each variety. Below you will see information from running wire and trimming for each variety on each row. For Marquette I decided to use a mid wire cordon. Which goes by different aliases. VSP, Vertical shoot positioning, Guyot, etc. The picture below should help you to see really what it is. Fruit is closer to ground, possible benefits of radiant heat. Though this should not be a consideration when planning, the rows are "Cleaner"
Vine closer to ground therefore it may make it more susceptible to early spring frost damage. Time to run the wire. I worked from 11-3 on a Saturday and only got the wires ran and about 10 vines tied. 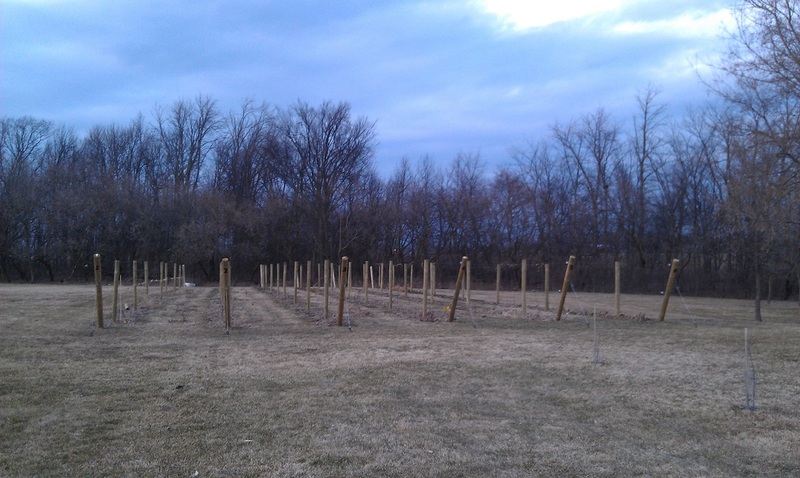 I went back out Sunday early in the morning and finished pruning and tying the remaining vines. 7 wires where ran total. 1 wire for the canes and other 6 are catch wires. overall it was nice for January as far as weather was concerned. I think it hit in the low 40's on Sunday. Ratchet Blocks are in place awaiting wire. Wire has been ran and tension is on the wires. Notice the top 3 wires with no ratchets. The 3 ratchets for these are at the opposite end of the row. A view down the row with the wires. It is hard to see in the picture but here is one of the Marquette vines pruned and tied to the lower wire. Rows 2-6, Grapes: Concord, Marechal Foch, New York Muscat, Niagara, and Lacresent. For the other 5 rows I decided to go with a High Cordon trellis system. 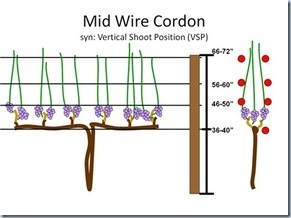 Basically as can see by the image below it is two parallel wires with the vine trained to the top wire, then shoots are eventually tied to the lower wire. I have never used this setup before But I think it offers some advantages that I cannot overlook when compared to the four arm kniffin setup that I was used to. Everything went well and was generally easier or at least faster than running the wire for row 1. Then again each row only had 2 wires plus the brace ends. I will comment that I spent an hour prefabbing the brackets to a wire ring with crimps. That way all I had to do was go out in the vineyard slide 3 tensioners down the end post and staple them at the correct level. the only Problem I had was one that I caused for myself. Maybe I was in a hurry and excited about running the wire. But in my head for some reason I thought I needed 6 wire tensioners on each row when really I only needed 4. So I bought 12 to many. The worst part is, me not thinking installed them on both ends of the row(s) when really I only needed to place them on one end and loop and crimp the wire at the other end. Oh well, I can adjust tension from either end and I guess if ever needed, wire replacement will be quicker. I ran wire over the coarse of 2 afternoons for the 5 rows. I ran all upper wire the first day then when the ground became a little softer (winter freeze) I installed the remaining earth anchors and attached them with brace wire to the end posts. It should be noted that not until earth anchors where attached did the wire get tensioned. I did not want to risk tightening the row wire without a earth anchor on the end posts and risk moving the end posts. On the second day that I installed the earth anchors that only took about 30-40 minutes, I used the remained of the afternoon to go through and Trim the grapes in the remaining rows. I find it peaceful to trim. It used to be a confusing slow process of deciding what to cut and what not not to cut. Now it is second nature and I can trim and tie a vine in about 30 seconds without even thinking about it. It took me a little over an hour to trim the remaining 100ish vines. My favorite thing about working out in the vineyard "each time you are done working you look back on what you accomplished and you can see physical changes you made, its very rewarding"
The last 5 rows are up and vines, though hard to see are trimmed and tied. So what is next? Let the vines grow, keep up on unwanted pests, and trim and tie in the dormant season, a.k.a. general maintenance. for right now though the only thing left to do is wait for spring to come.